Vancouver has a very nice tea scene. It is one that I was unable to fully experience. My little travel companions had other ideas! I was pleased to have afternoon tea at The Urban Tea Merchant; it was tea for one, and that was just fine. The store is bright and colorful. The tea room is more sedate but with pops of color provided by the same paper lanterns that decorate the store and the back patio. I ordered the Traditional Tea Set of tea sandwiches, fresh scones with tea-infused jelly and Devonshire creme, and sweets all prepared daily and in-house. The only exception was the macaron. Macarons sold in the store are flown in daily from Singapore! The TWG Tea Design teapots represent the convenience of modern functional features and the pleasure of serving tea in the classic beauty of an exclusive TWG Tea design. A high-quality polished stainless steel warmer with an inner felt lining envelope the porcelain teapot and keep the tea warm for one hour. The teapot gave the afternoon tea a couture air. 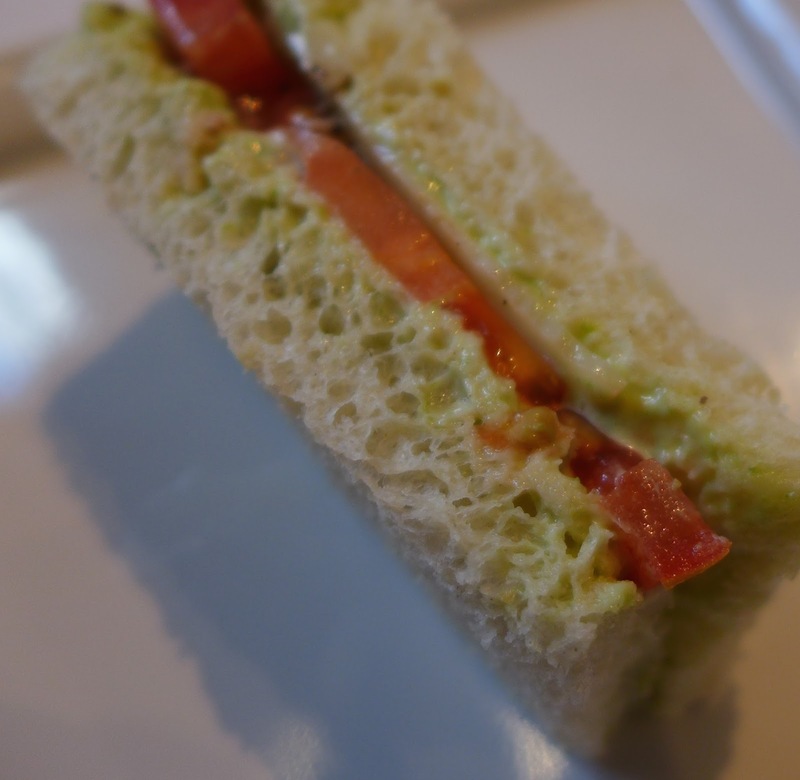 My favorite sandwich was the tomato and watercress aioli savory. It was very good. I also liked the cucumber and cheese savory. The other savories were the Earl Grey Gentleman Tea Sandwich with Fig Jam and the Smoked Salmon Rosette Tea Sandwich with Wasabi Aioli. An additional tomato sandwich was substituted for the Imperial Lapsang Souchong Chicken Cup. The use of flowers and fruit to decorate the three-tiered tray reminded me of platings I had seen during my visit to Singapore several years ago. The scone and sweets tiers were also satisfying. The scone was fresh and warm, soft on the interior with a bit of an exterior crunch. There was also a spiced madeleine. My other favorite was the panna cotta made from Eternal Summer Tea topped with a mousse made from Matcha Nara. Surprisingly, I did not enjoy the the chocolate tart. The white and dark chocolate covered strawberry was a sweet and refreshing way to end the tea set. Afternoon tea at The Urban Tea Merchant is highly recommended. 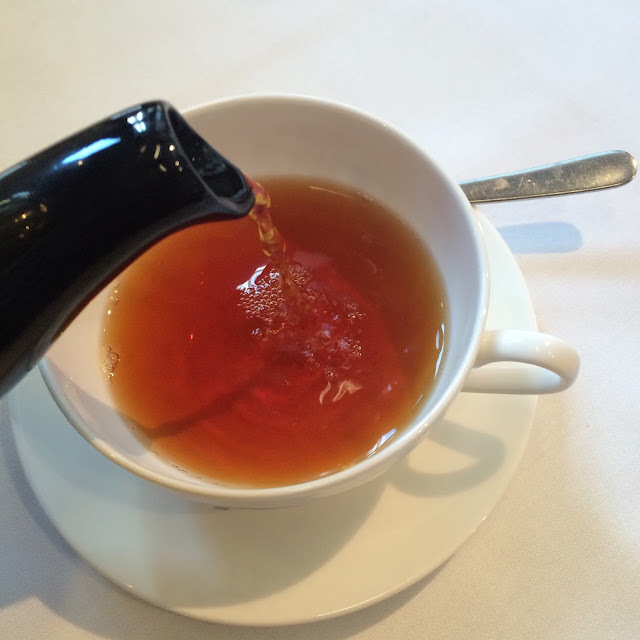 The food is fresh and delicious, the tea selection is exceptional, the service is great (my teapot was refreshed by adding altogether new leaves and water), and the location in downtown Vancouver is convenient. It was a nice treat for myself but it would be fun to share this tea set with a friend or two. Traditional Tea Set and New York Breakfast Tea courtesy of The Urban Tea Merchant. P.S. I am missing New York so will start steeping the NY Breakfast as soon as possible. I purchased the Meleng FBOP to remind me of my tea time at The Urban Tea Merchant. I haven't been to Mariage Freres but am glad you mentioned it; that teapot seems very Marie Antoinette. I don't have an answer for your question about the tart toppings. I'll ask TUTM.